"A truly magical evening", guitarist Tony Clarkin confirms, "especially seeing as the show was a sort of home game for us, since all of us are from around the area between Birmingham and Wolverhampton, although during the last 20 years we have performed in Birmingham only once. In this respect it was a special moment for MAGNUM in more than one way." According to the occasion, band members Tony Clarkin, vocalist Bob Catley, bassist Al Barrow as well as their two newest members keyboarder Rick Benton and drummer Lee Morris confidently played their way through a well-chosen mix of classics and newer songs, which rather successfully join the ranks of the band`s long tradition of atmospheric rock songs. Star guest Tobias Sammet (AVANTASIA, EDGUY), too, was swept along by this enthusiasm and the blazing interaction between the musicians and their Birmingham audience when he went on stage for "Lost On The Road To Eternity" to lend energetic support to vocalist Bob Catley just like he did for the track's studio recording. Oh and just by the way: As a forerunner to this gripping live album "Lost On The Road To Eternity" will hit the market as a digital single on November 9th 2018. 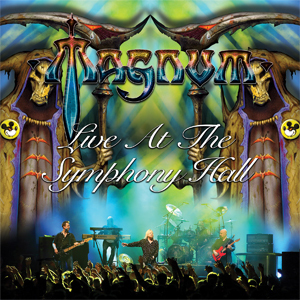 Live At The Symphony Hall will be released through SPV/Steamhammer on January 18th, 2019 as 2CD DigiPak, 3LP Gatefold, download and stream.